There are many dozens of models of Continental vehicles I see on Britain's roads, but sometimes a native subject helps to set the scene for a layout. I think this is especially important when a layout is to an unusual scale. This post is a list of commercial models of British road vehicles to 1:87 scale I have found useful for my own layout, with additions suggested by other members of the RMWeb and a few other models I have found along the way. All of the models here with 'handed' windscreen wipers (notably Brekina and Rietze) have them moulded on for left-hand drive ... I can cope with contemplating moving steering wheels across but I draw the line at windscreen wipers. ". . . I draw the line at windscreen wipers"
Understandable, although if a fine enough marker/lining pen was available in black/silver/grey, this could be the simplest way of adding windscreen wipers, after filing/sanding off the old ones! A nice 1960s lorry that's H0 scale is the Matchbox Dodge as used for models 37 and 63. There's also a three axle version of the cattle truck. Husky did a Commer Walk-Thru van that's H0 too. Diesel version, so perfect for Rail Express Parcels! There were also a number of 1950s/eary 60s British vehicles in the EKO range (including the Sava van which was a BMC LD built in Spain under licence). I think it would be sensible for me to leave my original blog post alone for a few months, and then rework it as single list of models which we know have been available. It is good to see ordinary cars like the BMC 1100 and the Cortina on the list ... the sports cars are nice in small doses but they would seem a bit out of place unless you modelled a dealership. There's a thought, for a model garage. 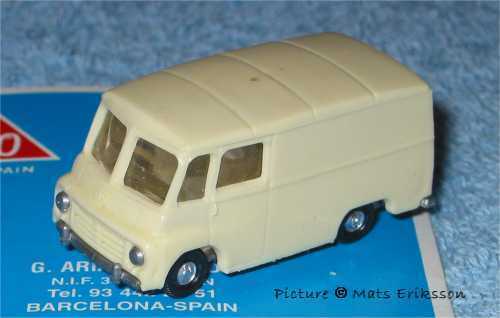 I've spent hours at swapmeets, with a battered Matchbox MB1 truck in my pocket as a guide to scale, and I wonder how many Husky Commer walk-thru's I never noticed. I am also reminded, Dodge were built in Britain. There are a few lists at http://www.british-ho.com, but the scope seems to include vehicles simply seen in Britain rather than built in Britain. Fresh suggestions would be great, but it is worthwhile making a note if something was done in a limited edition or is simply hard to find. Most Opels (Wiking, Herpa, etc.) from the late 1970s on can be used with minimal badging changes as Vauxhalls. With more determination the Kadett C, Ascona B and Rekord E could become Chevettes, Cavaliers and Carltons respectively. Going back a few decades, my personal favourites are Lledo's AEC Renown LT5 bus and the Matchbox Models of Yesterday Preston tram. Neither is the last word in detail, but they're both chock-full of character and cheap to buy on eBay. Useful link and what a nice Minx! The first (4mm) car kit I did way back in '85 was a Minx, though a series I/II. I actually omitted the Lledo AEC Renown (and gave my model to a charity shop) because it seemed so old - and I would never use it on my layout. Which makes me think, we can be much more tolerant of 'period' for road vehicles than trains on a model railway layout. We can have a Morris Minor or an Austin Mini on a 2018 layout, and probably in pristine condition too. The tram is really outside the scope of what of was thinking but if it turns out to be a one-off for 1:87 before we move on to modern trams, I'm sure it belongs here. My imaginary island has a railway preservation society (of course) and this might be the time for it to become more of a 'historic transport group'. Brekina's Rover P6 can also be added to the list. The cab measures 27.5 mm wide and 29 mm high, and extends 16.5 mm in front of the axle. All three dimensions equate to a precise 1:87 scale. The wheelbase of the model is much shorter than the wheelbasde of the test vehicle, but the cab looks spot on. The lorries were built at Dunstable. A fascinating topic, thanks. I've been collecting British outline road vehicles for approx 30 years now! and have come across a couple of sites you may find interesting. Hope you enjoy a look through the BoS website but don't get carried away! I would like to add some other vehicles that go nicley with British HO and also a great supply for Dutch, Portugese, Danish, Spanish and Argentinian layouts. Bedford TK made by Matchbox. - Major Pack MP 2 tractor. The Wiking Ford FK 3500 lorry goes nicely as the Ford Thames Trader MK II. There are lots of new suggestions here. We should be wary of including models which may look out of place in a British scene ... the Lesney Major Pack MP 7 is a Hendricksen tractor, and the Lesney Lomas ambulance is very small for 1:87 scale - indeed Lesney themselves described it as 1:100 in their catalogue of the time.